This section contains magnetic resonance images (MRIs) of isolated human hearts. The images presented are similar to those acquired during the diagnosis of various cardiomyopathies. Prior to imaging, the great vessels were cannulated and the hearts perfusion fixed in 10% buffered formalin for a period of 24-48 hours under 40-50 mmHg such that the hearts would retain an end-diastolic shape. After perfusion fixation, the hearts were placed in a polymer container containing 10% agarose gel and all air was removed in order to reduce imaging artifacts. 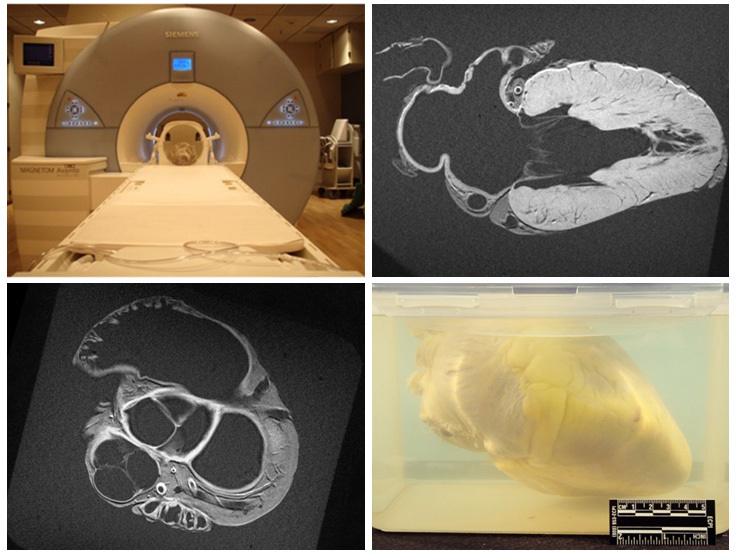 The image to the right shows (clockwise from the top left): A typical MRI magnet (3T Siemens), a long axis slice of a human heart (two chamber left side), a short axis slice of a human heart and a preserved human heart prior to MR imaging. All images were acquired using a slice thickness of 1-4 mm in either a 1.5T or 3T Siemens scanner. The in-plane resolution of the images ranges from 0.8 mm to 2.0 mm. For additional details regarding principles of MRI, please see the CMR tutorial.